I have a super exciting announcement. Seriously, this has been an on-going project for over two months now and I’m so happy that this moment has finally, finally come. In case you weren’t able to figure it from the title of this post; we’re moving! Not me, literally, but Must Come Hungry has found a new home on the inter-webs. I’ve been working on the design of this blog probably since the day I wrote my very first post. Man, has this been a frustrating process but I’m glad to say that I have learned so much more about web design and word press in general. 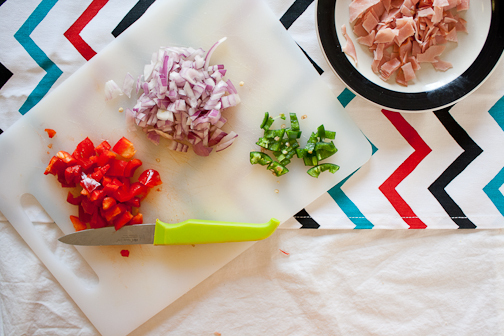 Please come join me and my kitchen adventures over at MustComeHungry.Com! I’m obviously obsessed with breakfast this week. I think I needed to balance out last week’s cookie explosion, though. Things have been getting pretty stressful around here; midterms, impending graduation, etc. It’s pretty terrifying and I just don’t have the time, patience or let’s be honest, the self control to be baking. After all, stressed is desserts spelled backwards and having a few dozen cookies sitting around the Must Come Hungry kitchen right now would reek some serious havoc on my diet. Frankly, I don’t think the cookies would get past their dough stage as I would most likely gobble them up before even being able to take a single photograph. It’s all about balance and I want to show you some other foods that I enjoy just as much, if not more, than desserts and cookies. I’ve always gravitated more towards the baking side of cooking anyway and I want to broaden my horizon to learn new, exciting things in the kitchen. Like I’ve said probably a dozen times, I love breakfast at all times of the day. I’d probably enjoy a big plate of pancakes more at seven o’clock at night rather than in the morning. Breakfast for dinner is practically my go to meal because unless you’re having some crazy chocolate-peanut-butter-deep-fried french toast slathered with ice cream and chocolate syrup, it’s usually pretty healthy. 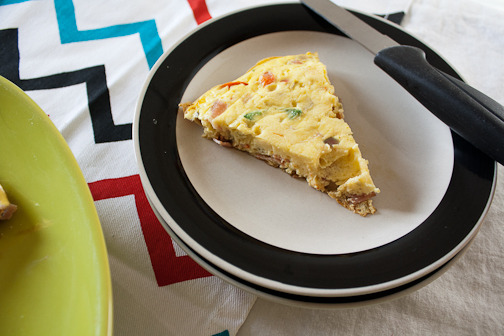 Which brings me to my somewhat recent discovery; the frittata. It’s so easy, delicious and can serve a family. 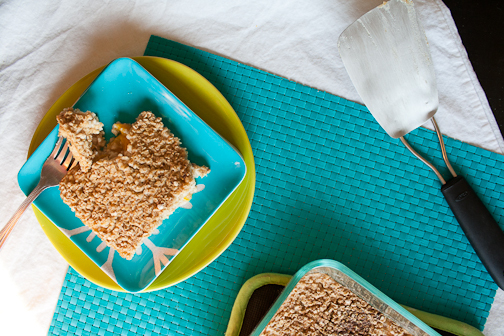 The best part, it’s all done in one single pan – meaning less dishes for me. Any meal that equals less dishes is a winner in my book. I’ve always been intimidated by frittatas. The first time the boyfriend and I attempted to make one, we failed miserably. 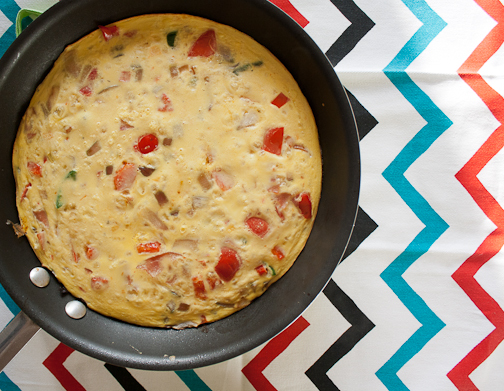 We ended up with a huge pan of scrambled frittata eggs; delicious, but not at all pretty. This one is easy, though, I promise and you can literally add any ingredients you want. 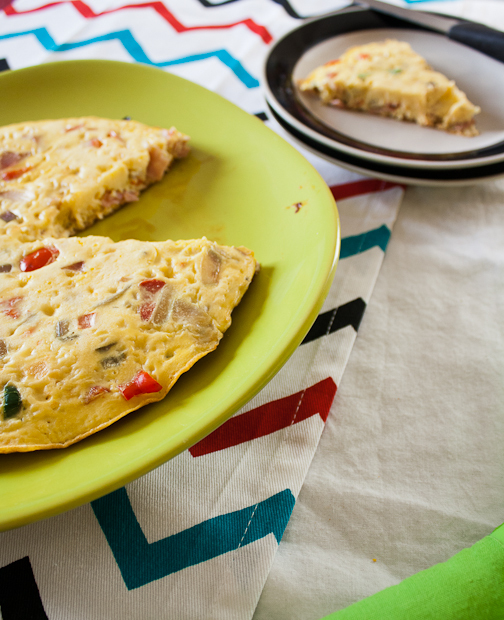 Frittatas are like the kitchen sink of breakfast foods; just add whatever you want. Preheat the oven to 400 degrees. 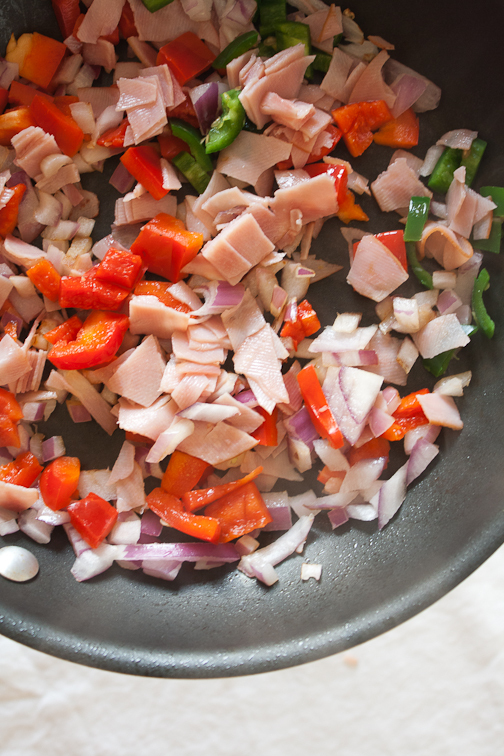 In an oven safe, greased skillet or frying pan, add the diced onions, peppers, jalapeno and ham. Quickly stir fry on medium heat until slightly browned and tender, about 2-3 minutes. In a bowl, whisk together the eggs, egg whites and cheese (if desired). Feel free to use 8 real eggs instead of the whites. Pour the egg mixture into the skillet, over the veggies. 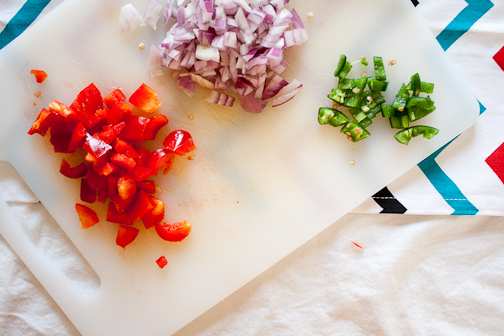 Allow the edges of the frittata to set, about 3 minutes. Once set, move the skillet to the oven and cook for about 15 minutes until it’s completely cooked through. Slice into wedges and serve. For some reason, this makes me think of The Lion King. When Timon and Pumba are distracting the hyenas with their luau. Are you achin’…for some bacon? This would be great with a side of bacon. Dessert for breakfast is definitely the way to go. Because, let’s be honest, everything always tastes better at breakfast time. Leftover apple pie? Friday’s Chinese take-out? Bowl of vanilla bean ice cream? Yes, yes and oh, yes, please! Feed me all of that for breakfast. Although, preferably not all together. I’m not so sure how well that veggie lo mien goes with a side of ice cream. There is something so appealing about starting my day with something warm and sweet (unless it’s ice cream, in which case cold is okay). I love oatmeal and have been known to eat it for breakfast, lunch, dinner and dessert. It’s just so good and when you’re on a college monetary and time budget, well, let’s just say that instant oats make frequent appearances around here. 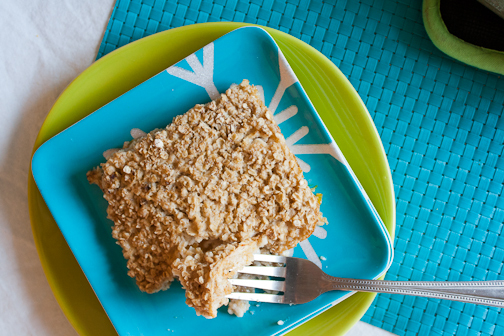 When I’ve had my fair share of instant oats, I love to switch it up and treat myself to some baked oatmeal. It’s just as easy and although it requires a bit more time, I really don’t have to worry about it after putting it in the oven. Thus leaving me to clean, shower or catch up on work while it’s baking. Hello, multitasking. I’ve got a pocket full of sunshine and a freezer full of peaches; my absolute, most favorite fruit. I’ve shed tears when they go out of season. Growing up in a sorta big farm area, I am very picky with my fruits. I know what great, fresh fruit tastes like and I will accept nothing but the best. Especially when it comes to peaches. I’ve tried dozens of times to accept the peaches that I’ve bought around here at school but they are terrible; not juicy, not sweet and definitely lacking in flavor. At the beginning of last semester, I would buy peaches from home, cut them up and freeze them. I would say that I had close to twenty-five peaches frozen in there and I did not want to use them. Seriously, I was like a greedy kid rationing out her Halloween candy until Christmas. 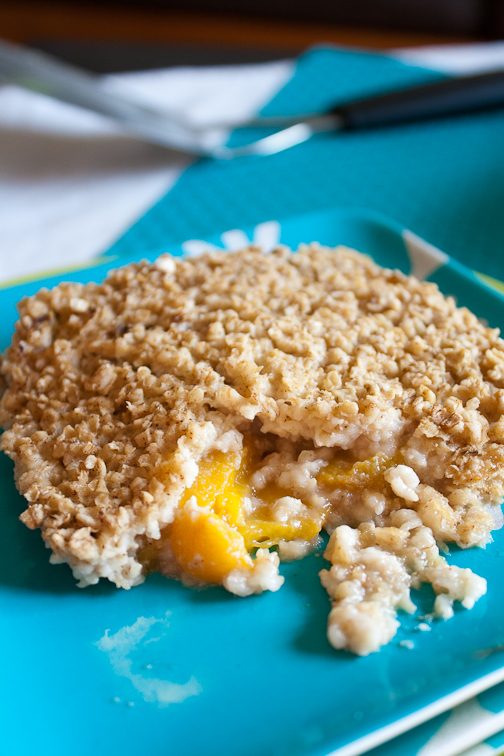 The other day I defrosted a bag to make this cobbler-oatmeal and nearly died. The peaches were still so juicy, sweet and fresh; it transported me right to summer. Needless to say, I don’t think the rest of those peaches are going to last the remainder of this week! My resistance has been broken. Preheat oven to 375 degrees. 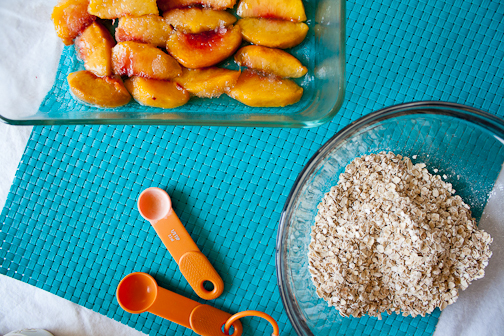 Place peaches at the bottom of a lightly greased baking pan. 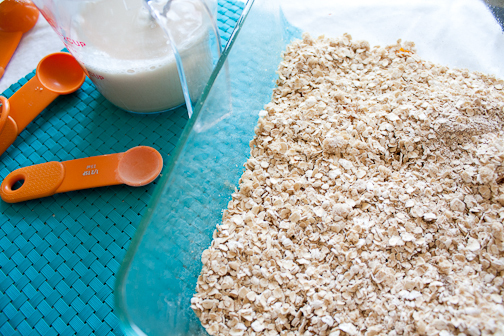 In a medium bowl, toss together oats, baking powder, cinnamon and brown sugar. In a separate bowl, whisk together syrup, egg, milk and vanilla. 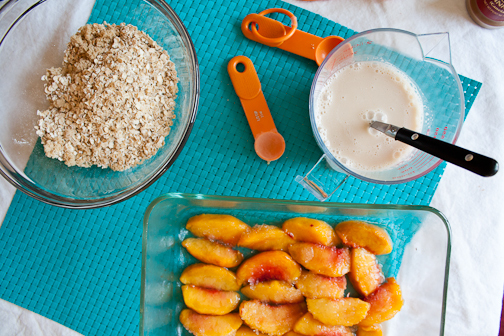 Pour the oat mixture evenly on top of the peach layer and then pour the milk mixture over top; be sure to pour it evenly over the oats and fruit. Bake for about 35 – 45 minutes, until the top is set and browned on top. Can be served warm or cool. Yesterday, I made scones. 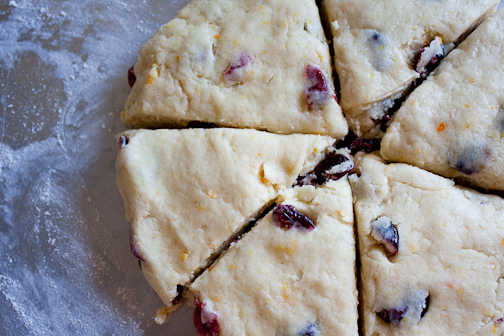 Today, I must make scones because yesterdays scones are gone and I’m sad. This was my first time ever making scones and maybe my second time actually eating them, I’m not sure. I cannot ever recall there being scones in our house; we’re more of a cookie, doughnut and pie family, I guess. These scones, however, have totally changed my tune. I would choose one of these over any doughnut. 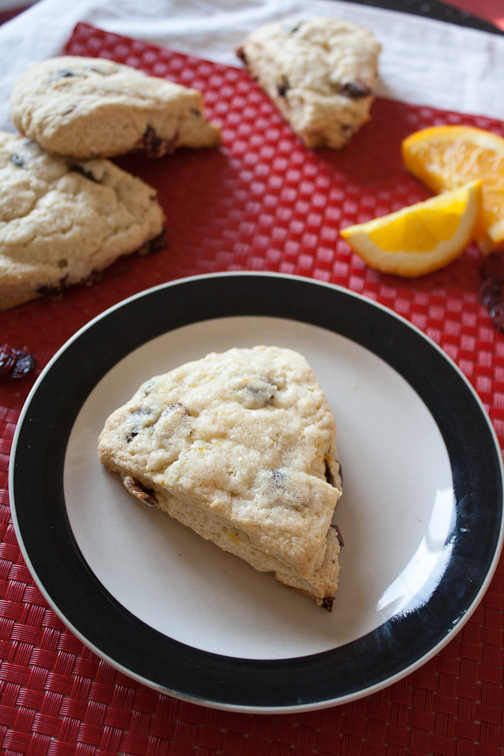 I was inspired to make these scones. 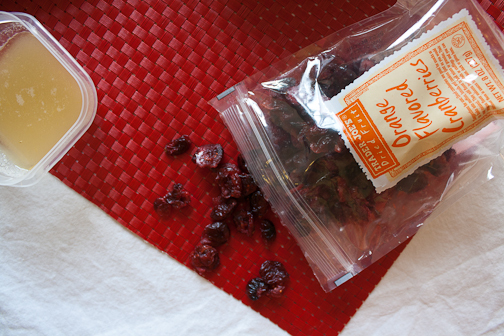 Ever since buying and eating Trader Joe’s Orange Flavored Cranberries, I just knew that they would taste amazing in a scone, muffin or any type of bread. I’m delighted that I chose to use them in a scone recipe; now I’m less tempted to eat them straight from the bag. Do yourself a favor if you live by a TJ’s, buy yourself some of these cranberries the next time you go. 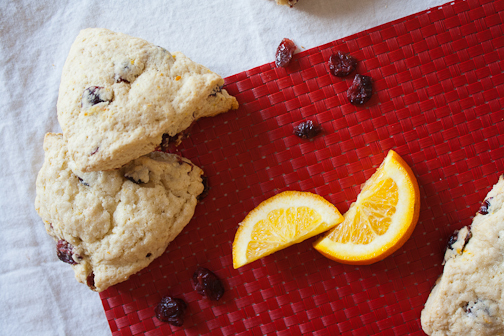 Not just because they are delicious but because they’ll make these scones ten times better. All I can say is, thank goodness I only made half a batch because it left me with six pretty large scones and I could not stop eating them. I took a nibble here and a nibble there and pretty soon one scone was gone. I quickly stored the remaining scones in a container to save for the boyfriend. I probably sent him about a dozen messages about these scones and how awesome they were; it would have been unfair for me to consume them all without him. So, I patiently waited. Needless to say, the scones are now gone and I’m a little sad. I would be baking more as we speak, er type, but alas, I am out of flour; today is a sad, sad day in the Must Come Hungry world. There are no scones, there is no flour and I have barely a cup of sugar left. Looks like I’m in desperate need of another trip to the grocery store; it’ll actually be my first trip this week! Usually by Wednesday I’ve already been to the store a half dozen times. Preheat oven to 375 degrees. 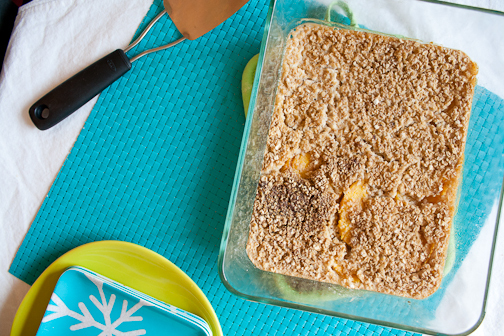 Set aside the 2 tablespoons of sugar and 1 tbsp. of orange juice for glazing the scones. In a bowl, combine flour, 1 cup sugar, baking powder, orange zest and salt. 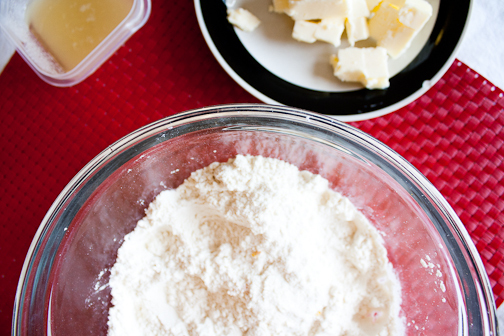 Add the diced butter and using your hands, incorporate the butter into the flour mixture. Continue until you have a nice crumbly mixture. Add the cranberries and mix. Pour in the milk and the rest of the orange juice. 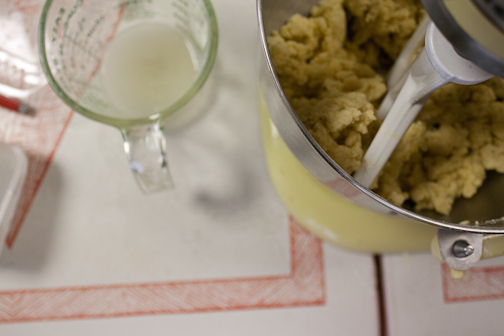 Using a fork, toss the dough until it sticks together in clumps; add more milk if the dough seems too dry. Make the dough into a ball and divide in two; press each half into a 6-inch round circle (1-inch high) on a floured surface. 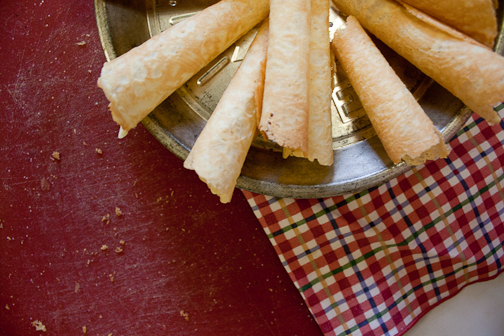 Cut each circle into six wedges and transfer onto a baking sheet. For the glaze, whisk the reserved sugar and OJ together in a small bowl. Brush the tops of the scones with the glaze before baking. Bake at 375 degrees for 18-20 minutes until golden brown. Allow to cool before serving. Now I’m off to stock up on flour, sugar and butter! Perhaps I should get some veggies too, you know, to balance everything out. Stop what you’re doing. 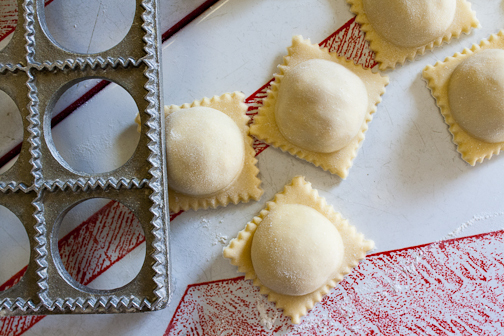 This is important; like you’ll never want to eat any other kind of ravioli important. Yes, these are hard work but trust me when I say that you will not regret it. 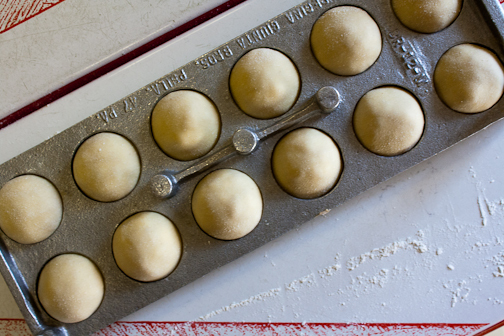 If anything, the hard work that goes into these delicious raviolis only makes them that much more tasty. Just like the Norwegian cookies that I posted last week, we usually don’t have homemade raviolis that often and usually just during any big holiday celebration. The great thing is that you get so many raviolis and any leftover pasta dough can be easily turned into fettuccine or saved for later. This is a recipe that my family has had for years and years. My Uncle used to own a pasta shop in Philadelphia and they couldn’t make raviolis fast enough. Even today, when our rather large family sits down for holiday dinners, we’re never quite sure that we’re going to have enough pasta or ravioli because we eat it so fast. There were definitely times when I’ve eaten quite a large amount of these and even as I am writing this now, I find myself craving them. I’ve had this recipe ready to share for awhile now, but I kept finding myself putting it off. I just had too much to say and these raviolis contain a lot of memories, a lot of Sunday night family dinners and part of me felt they were almost too personal to share. But these are just too good to keep to myself. Although, I will admit, while making these with my Dad, he made me promise that I would not reveal our family “secret ingredient”. Don’t worry, though, even without that “secret” these are a million times better than any store bought ravioli will ever be. Because they’re filled with hard work, sweat and love. Once you master the making of the pasta dough, you can pretty much fill these babies with anything; meat, cheese, veggies. However, sometimes you can’t beat a classic cheese ravioli. 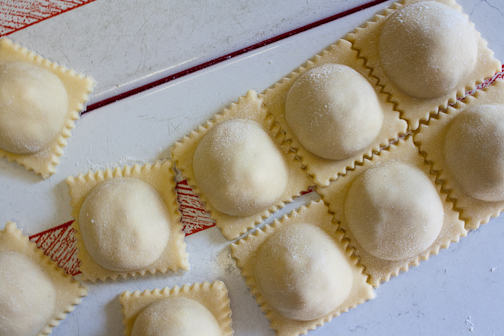 It’s the filling that really makes homemade raviolis stand out in a crowd; because there is no skimping on the cheese. These are stuffed with a ricotta cheese mixture that I could practically eat straight out of a bowl. These make look and sound overwhelming but trust me, you can do it. Even if you do not own a ravioli mold. Yes, it’ll be a little bit more work but it can be done and they’ll still be delicious. This is the best meal to treat your family to on a Sunday night served with meatballs and garlic bread. These are one hundred percent children approved in our family. 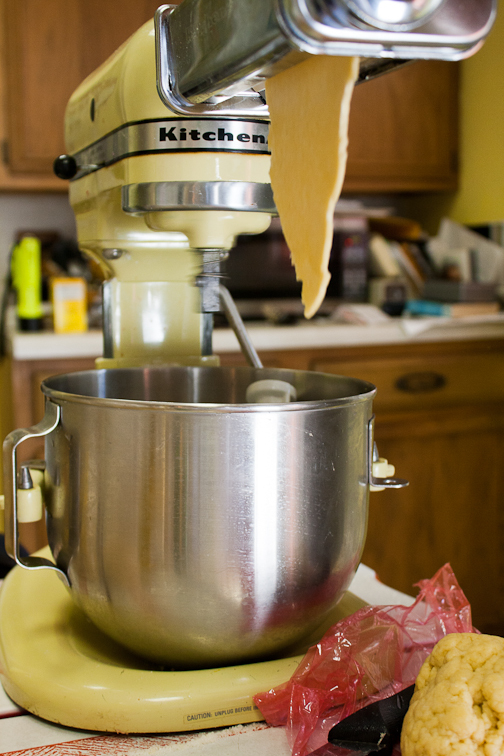 In the bowl of stand mixer, add the flours. Slowly add in the egg mixture to the flour. Then get warm water and add slowly. You do not want the dough too dry or too wet; just enough for it to come together. Wrap the dough into a ball and cover with saran wrap; let sit for about an hour. If you have a lot of dough, this part can be easily doubled. For every pound of cheese you have, you’ll need an egg, the 1/4 c. cheese, salt, pepper and parsley. Mix them all together until well combined. 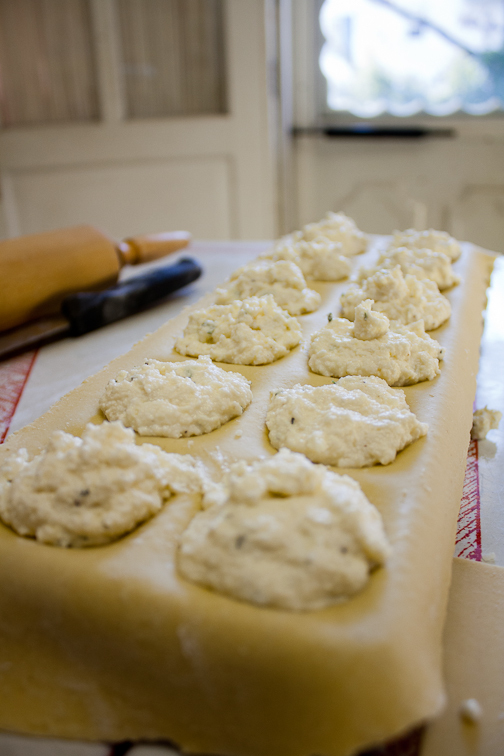 When the dough is rolled out, place it on top of the ravioli mold, letting any excess dough hang off. Using a spoon, carefully spoon in the cheese mixture onto the surface of the dough (above the circles in the mold, though). Once it has been filled, take another sheet of rolled out dough and place it on top of the other sheet with the cheese mixture. 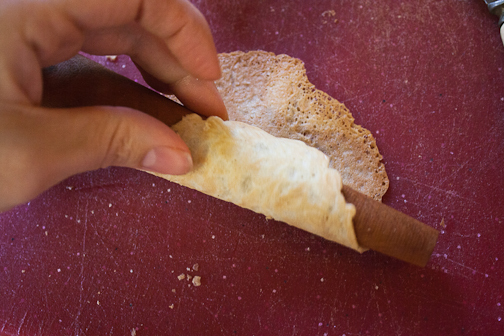 Using a rolling pin, roll the top sheet into the mold. 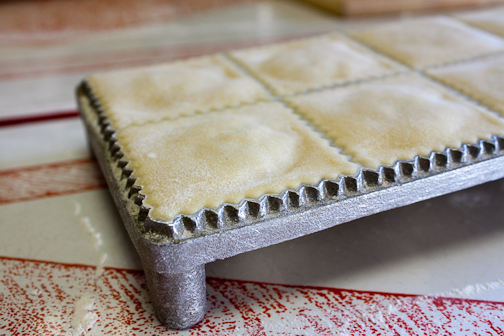 This cuts off any excess dough and pushed the cheese into the mold to create the ravioli shape. Don’t be afraid to push down hard. 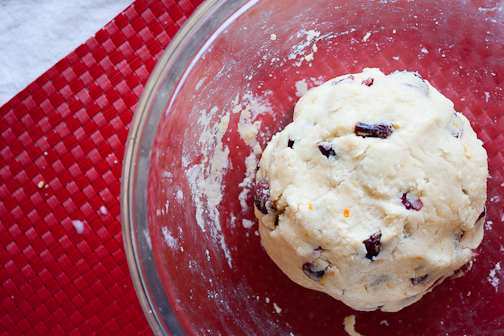 Take all the dough scraps and return them to your ball of dough to be used later. 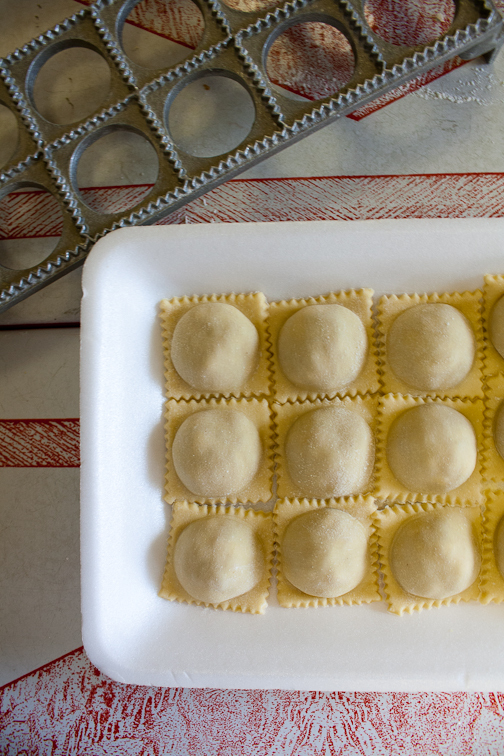 Flip the mold over and gently push out the raviolis. You can either put them aside to cook later or place them together on a sheet and sprinkle with semolina or cornmeal (to prevent them from sticking together) and freeze to be enjoyed later. Continue this process with the rest of the dough and cheese. Too cook, boil water and add in raviolis. If fresh, boil about five minutes until done. If frozen, boil about seven minutes. Drain water and serve with your favorite gravy and sides. Phew, I feel like I just ran a marathon. Since I’ve already shared two cookie recipes with you this week, I figured why not go for another? Especially since this cookie is my absolute favorite. I’ve been eating this cookies for as long as I can remember and I’ve been helping my mom make them for almost as long. These cookies are special and we only get to have them about once a year. I think what’s so special about these cookies is that you can only make one at a time. I know, it sounds crazy, but trust me. These cookies are worth every minute and every bead of sweat. 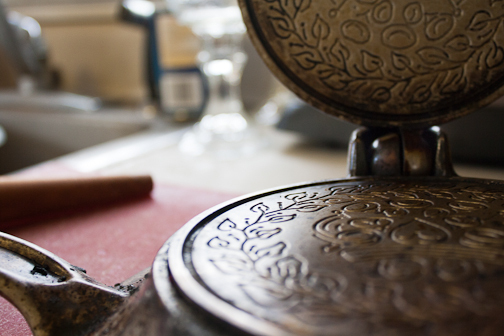 As you can see, our krumkake iron is older than I am; but that just makes this whole process that much more special and meaningful. There are so many stories to be told about the making and eating of these cookies. I have to say, the most enjoyable part is in the making of them. While you can definitely make these alone, in my family, we see it as a two person job; usually me and one of my sisters. We usually only make these around the holidays, so two (if not all three of us sisters) will be seated at the kitchen stove, laughing and talking, singing Christmas songs. I think that’s why these cookies taste so great. Because you know they’re being created around laughter, fun and love; it sounds cheesy but it’s true. I love making these cookies with my sisters. True Story: the first time my sister and I made these alone, my parents were out and trusted us to make them alone. Well, we may have set the burner on fire. Our parents had to rush back and were reluctant to let us continue baking. Needless to say, we thought we were never going to be allowed to bake them again. 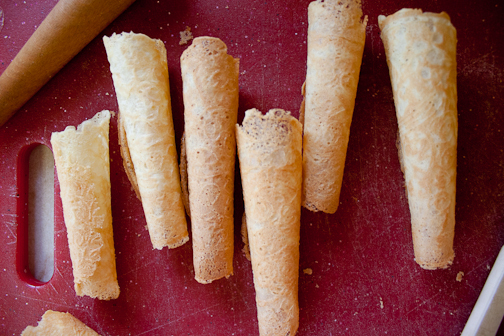 But we continue to find ourselves each Christmas season, in the kitchen burning our fingers making these. This past Christmas, I was stuck at school until the 23rd of December. The only thing that upset me was that I was going to miss the making of all our cookies. While I missed the baking of all the many other Christmas cookies, my family saved this one for me. Even with all the million things we all had to do on Christmas Eve, we were able to squeeze in our Norwegian Cookie tradition. So, while I may claim that this or that cookie is my favorite, these cookies will always have an extra special place in my heart. In a small pan on the stove, melt butter and mix in sugar; Mix together well. 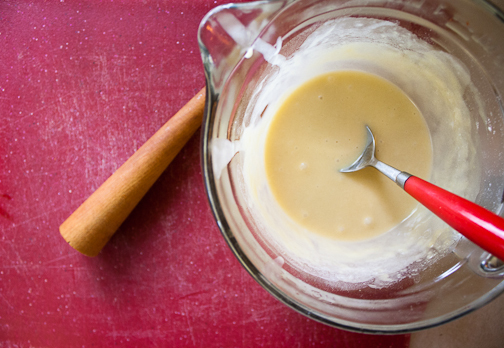 Transfer butter and sugar mixture to another bowl and add flour, eggs and vanilla. Once all is combined, slowly add warm water to make thin batter. 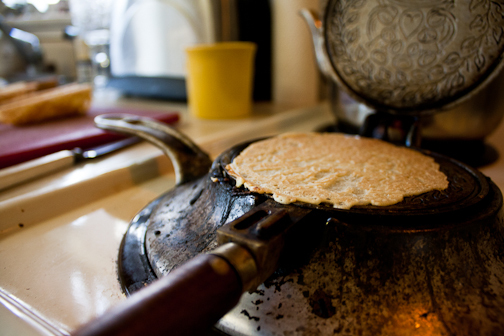 Place the krumkake iron on top of stove burner; turn to medium low heat. Wait for the iron to heat up; test by dropping a few drops of water on the surface of the iron, if the water sizzles and jumps across the surface, it’s ready. 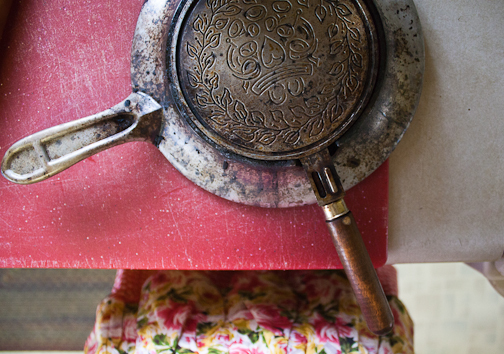 Using a small ladle, spoon a little bit of batter onto the surface of the iron, slowly closing the top. Make sure not to spoon to much batter, as it will leak out the sides of the iron. Flip the iron over to cook other side of the cookie, about 1 minute on each side. 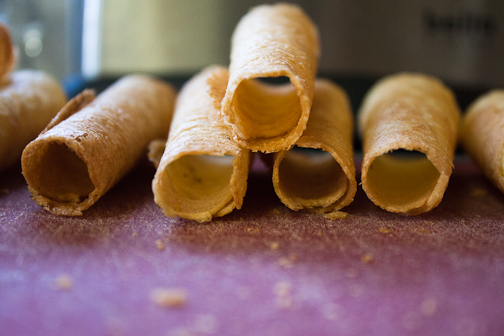 When cookie is golden brown, using a knife, gently lift the cookie out of the iron and quickly roll the cookie using the wooden cone. Set cookie aside to cool; repeat with remaining batter. 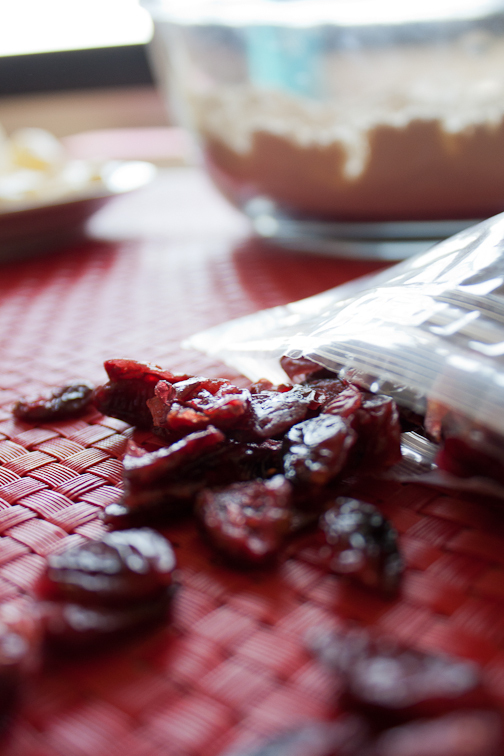 Cookies are fragile, so when storing them, gently place in a tin or Tupperware and cover with wax paper or saran wrap. These are cookies made with love.